Series 5 Issue #18 Snakeman On A Plane! Today's story begins at the busy Megalopolis Airport, where the Mechanical Maniacs are currently waiting in line to go through security. Spark Chan: I hear Hawaii is beautiful this time of year! Geminiman: It's about time we treated ourselves to a vacation. Hardman: Hey, it'll be worth it in the long run. We'll be flying first class! There'll be free beer, big cushy seats, free beer, complementary pillows, free beer...free beer man! Snakeman: But why don't we just teleport there? Needlegal: Because under pressure from travel industry lobbyists, the government banned non-emergency international teleportation to keep the airlines in business. Topman: So how did we afford first class tickets to Hawaii again? Shadowman: How do you forget something as significant as that? Topman: I didn't...I just figured the...other people in line?...yeah them...they'd be interested in knowing why we're here. Shadowman: Well, it was a lucky break for us. We picked up the big cash reward from the city for solving the Mystery of the Haunted Mansion on Terror Ridge a couple days ago. What an adventure that was. Magnetman: Adding onto the reward the "bonus" we pocketed from the thugs running the secret drug cartel in the "Haunted Mansion" made the victory all the sweeter! Topman: And of course, rather than invest the money wisely and put it towards our living expenses, we blew it all at once on a two week trip to a tropical paradise! And here we are ready to depart! Shadowman:...why would you ask us to recount the situation for your sake, and then finish the story yourself? Topman: Shut up! That's why! Magnetman: Hey Hard, it's finally our turn. Get moving already. Hardman: Sure thing little buddy. Geminiman: I'm seeing it happen before my eyes, yet I have no idea how it's physically possible. Hardman: Do aluminum cans set these things off? Ah, whatever, better safe than sorry, right? Hardman: Aw come on! What's it reacting to, my belt buckle? Because I will NOT drop my pants in public...while sober. 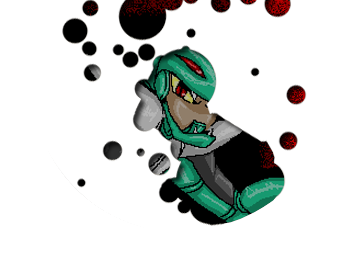 Magnetman: Hardman, your entire body is a giant chunk of metal. Hardman: Oh yeah...so...do I put myself in the pan or what? Security: It's alright sir, you can go on ahead. Just head down the large hall to the right. The staff on the other side will show you where to go from there. Hardman: Really? Alright! See you on the plane guys! Spark Chan: Um...isn't that the way to the cargo dock? Security: Your friend weighs over two tons and can technically be defined as heavy machinery. So he qualifies as cargo. Geminiman: He's not going to be too happy about that. Snakeman: Unless...they don't serve drinks in the cargo hold, do they? Snakeman: Then yeah, he's going to be pissed...or rather he won't be and that will make him angry...you know what I mean. Shadowman: Hey, as long as we don't have to hear his complaining, it works for me. Security: Dogs don't smell anything on him...alright sir go on ahead. Just follow the blue line. Magnetman: Wow, that was easy. Spark Chan: Isn't Magnet-hun every bit as metallic as Hardy? Needlegal: Yeah, but Magnet's also...well, a Magnet. Shadowman: But metal detectors are electromagnets themselves, how does Magnetman fry it walking through it when...you know what? Forget it, let's just roll with it. Less of a headache for us. Snakeman:...what was I complaining about again? Topman: Isn't it great not having Hardman around to hog up all the seat space for once? Spark Chan: I hope he's okay, wherever he is. Shadowman: Oh he's fine. Flight attendant? Keep the pillows coming. Topman: Ahh, this is the life. I'm getting kinda hungry though. When is lunch served? Shadowman: I think a cart is supposed to be coming around soon. Topman: Is it nearby right now? I'm starving. Shadowman: Well, I would open my eyes and look around for you, but that would disrupt my state of ultimate comfort and I don't want to go through the work of achieving it again. Topman: Hey, it would be easier for you than me. I have a window seat, you have an aisle seat. Needlegal: You're both ridiculously lazy. It's amazing you can do anything on your own. Shadowman: Alright miss energetic enthusiastic, YOU turn your head and look for the lunch cart. Needlegal:...but if I do that, then you won't learn a thing about laziness. I can't do that. Snakeman: Guys, I have it covered. I just happen to have the premier weapon for the purpose of "searching" for things. I'll just have a Search Snake go find the lunch cart for us. Geminiman: Aren't you worried about frightening the other passengers with a mechanical snake crawling loose in here? Snakeman: I'm more worried about losing my comfort zone. Besides, it's not like I'll make it attack anybody, it's just on recon. Flight Attendant: Today's specials are Lobster and Steak. Snakeman: Ah, there you are. Lobster, please. Just dump it into my open mouth. Spark Chan: I guess you should call it back now, hun. Snakeman: (Talking with his mouth full) Call what back? Snakeman: Oh yeah, that thing. Snakeman: Calm down everybody, that snake won't hurt you. Geminiman: And if it perceives you as a threat it may bite you with its needle-sharp metallic fangs and inject you with a corrosive super-venom capable of dissolving the interior systems of even the most heavily armoured robots and cause lasting damage by contaminating its oil circulation system. Snakeman: Will you morons shut up? I made sure to disarm the snake when I generated it. There's no explosive inside it and the super-venom has been diluted so that it's harmless to robots. Snakeman: BUT that snake's fangs are corked so it's not like it's going to be biting anything! Shadowman: Wait...you can generate Search Snakes sans bombs, with varying degrees of super-venom...and with optional corks on their fangs? Snakeman: Oh sure, I've been adding customizations like that to my weapon every chance I get. Does anyone want to see me create a Search Snake painted with candy-cane stripes wearing a sombrero? Spark Chan: Oh, I do! Topman: Sombrero? Can you make it sing "La Cucaracha" while you're at it? That would be sweet. Shadowman: Enough! We have a serious panic on our hands, and we're in serious trouble if we don't find a way to stop it. We can start by not adding any more snakes to the mix to further spook the passengers. Search Snake: La Cucara-CHA! La Cucara-CHA! Na na na na na na na. Shadowman: Snakeman, what did I just say! Snakeman: Well sorrrry! It was halfway finished when you started taking, what was I supposed to do? Passenger: AHH! A Red Striped Mexican Singing Snake! They're the deadliest of all!! AHHH!!! Geminiman: You remembered to disarm that one, right? Snakeman: Well, it's diffused, but if its fangs are corked, how is it supposed to sing? Don't worry though, it can't bite and sing at the same time, so no problem. Magnetman: Does it know any more words to that song? Magnetman: Because if it keeps singing like that it won't need to bite anyone, it'll just annoy us to death. Needlegal: Snake, just shut those things off already. Snakeman: Um, with all the distraction caused by the screaming people and that delicious lobster, I kinda lost track of the first Search Snake. Shadowman: No! What? Why the-? Stop making more of those things, what's wrong with you? Topman: You could have at least used the sombrero snake to do that. Snakeman: How? I already shut it down. Snakeman:...okay, it seems to not want to obey my commands. Probably all the extra customizations screwed it up. Passenger: I knew it, they're loose, we're all going to die. Needlegal: No offense sir, but I'm pretty sure you don't know anything. Passenger: I'm an undercover security officer. There was a discreet terrorist threat about turning something in the plane's cargo into a weapon. All the cargo was carefully screened for its possible threat and stored to eliminate all risk, but the last thing we suspected was that they would rig the crate full of exotic poisonous snakes being sent to the Honolulu zoo to open and fill the entire plane with these deadly reptiles! Geminiman: One: If it was the last thing you suspected, then the first thing you said was a lie. Two: You're a crappy undercover security officer. Three: These are harmless toy snakes made by my friend here and have nothing to do with the crate being sent to the zoo. Security: You don't understand! I knew the crate would open up mid flight! They wouldn't listen to me, but I know the danger is very real! Shadowman: Calm down. Think about it. Is the crate secured tightly? Shadowman: Are the snakes in any way unusually aggressive? Security: Yes, they're genetically engineered to be violent to entertain zoo patrons more. Shadowman: Well, is the door connecting the cabin with the cargo hold secured? Security: Actually...yes. And all the vents and other access points connecting the cargo hold are either sealed or under close surveillance. Shadowman: Then there's nothing to worry about. Spark Chan: Everybody is still in a panic! Shouldn't they have realized by now that the snakes aren't dangerous? Security: That may be my fault. I've been going around telling everyone about the imminent death the crate of snakes in the back is going to cause. Kind of like how I told you just a minute ago. Geminiman: Like I said, you are a crappy undercover security officer. Security: Oh sorry. Aside from the arms, legs and metallic armor, you just really look like a Snake. Snakeman: Ow! OW! Quit it! Snakeman: OW! AAGH! Please, no more! Needlegal: You gotta admit, you deserved some of that. Needlegal: I was going to ask if you found the missing snake yet. Shadowman: THREE now? Are you insane? Snakeman: That's one to eat the malfunctioning Mexican...one to find the first one...and one to find the other one I sent to find the first one which I also lost track of just a moment ago while everyone was trying to kill me. Topman: Mind running that by me again? Ten minutes later, Snakeman has filled the entire cabin with errant Search Snakes. All the passengers have barricaded themselves at the front. Some are suffering from bites, but none are dead from venom yet. Snakeman: That's it, I'm out of ammo. Shadowman: Finally! Why the hell did you keep making more no matter how many times we screamed at you to stop? Snakeman: I...I don't know! I just got caught up in the moment okay? I just kept losing track of on snake, so I had to make another to find it, then another, and another, and another...hey, check it out, I got a spare W Tank. I knew I kept one of these around for just such an occasion. Shadowman: Enough is enough! I have had it with these mother*censored! * snakes on this mother*censored! * plane! Snakeman:...okay, so they're not so hard to find any more. What do we do now? Shadowman: (gets another Shadow Blade ready) And now to use the rest of these to hunt down and destroy the snakes the old fashioned way. Topman: We're with you boss! Snakeman: Yeah, I guess I'll just wait here for you to slaughter my boys. It's cool. Shadowman: Just remember, no weapons that will pierce the fuselage and cause decompression. Keep it clean, people. Geminiman: Oh, too bad all I got is this laser. Guess I'll have to stay behind too. Magnetman: Don't you have a sword and crystals you can form into weapons and stuff? Geminiman: No, shut up...I just hate those stupid Search Snakes, alright? I mean, they are my weakness and all. Spark Chan: Come on, that's not the fearless Lennon I know! Geminiman: ...You know what? You're right! Weakness or not, I can face any challenge! It's time for vengeance you scaly green bastards! Yaaahh! Geminiman: Get these scaly green bastards off me!! NOW!! Geminiman: It's all right...just avenge my death. Snakeman: You're not dying. Nobody's dying! The snakes aren't that venomous! Shadowman: Well, it's down to us five now. Come on, if we don't hurry they'll crawl into the internal systems and bring the whole thing down. Topman: Come on you little buggers! Clamp on, I'm much tastier than the last guy! Topman: That didn't hurt at all. Magnetman: If I pull in a bunch of them at once by magnetizing myself, will that cause the plane to crash? Needlegal: (rapidly stapling snakes to the ground with her needles.) Normally, probably. But this plane hasn't had much trouble staying in the air with you being on it so far, so I don't think you have much to worry about. Magnetman: Heh, take this, physics! Shadowman: Do frogs eat snakes? Spark Chan: (paralyzing several snakes at once with Spark Shocks) I'm pretty sure snakes eat frogs. Shadowman: Well, they just haven't met a frog big enough then. Magnetman: Argghh! I knew as soon as that thing started singing I was going to have to be the one to kill it! Shadowman: I knew it, they're getting into the instruments. We're not going fast enough. Needlegal: Well, it looks like all the snakes in sight are broken. Snakeman! Are you sure you can't reconnect with the remaining ones if you concentrate? Snakeman: Well, I guess. If I knew exactly where they were. Shadowman: Why are you having so much trouble with this? You control these things by remote all the time. Snakeman: I'm getting too much interference here though. Maybe it's the plane's radar or something. Could the pilot turn that off for just a second? Magnetman: I'm the walking electro-magnet, and Snakeman's the one who's technology is majorly screwing up around a plane? Pilot: This is your captain speaking. Why didn't you just say so to begin with? I can turn off everything causing interference for a second as long as you get these stupid snakes turned off. Shadowman: Shouldn't you be flying the plane right now? Pilot: I had to come back here to see what all the commotion was. Over and out. Geminiman: (very swollen) Jutht thurn thuh bluhthy thihns OFPHHHH!! Pilot: (over intercom this time) This is your pilot speaking. The lights are fixed and now that I'm back at the controls, the turbulence has also stopped. Yes, you thought that was because of the snakes too, didn't you? No, that was just because I left my post, did not hit auto-pilot, and my co-pilot is incompetent. It looks like we're just about clear for landing in lovely London, England. Please sit back and enjoy the rest of your flight. Topman: England? What happened to Hawaii. Pilot: This is your captain speaking. We ended up a little off course. Even though I would have had to start going in the exact opposite direction upon takeoff and the cockpit was completely unaffected by the recent panic, I feel safe in redirecting all the blame for this new destination at the snakes. Over. Topman: Gee, thanks a lot for ruining our vacation, Snake. Spark Chan: Don't listen to him. I hear the United Kingdom is beautiful this time of year too. A vacation is a vacation, right? Shadowman: That we should be a lot more careful and responsible with our weapons, there's no telling how things can get out of control. Needlegal: No, that even the most absurd-sounding doomsday scenarios can become a reality. And when faced with such a threat, it should be treated dead serious, and not as a joke, because then things will only get more out of hand. Shadowman: (snickers) Yeah, snakes on plane. You're right, this was kinda funny. Needlegal:...that's not what I meant at all. Topman: Well, until we're faced with the threat of Metools In A Teleporter, we are...The Mechanical Maniacs! Hardman: (covered from head to toe with live poisonous snakes) Worst...vacation...ever.